The Wiseman’s Building in Peterhead has been lit up with festive projections which will bring cheer to the town for the whole of December. In a first for the largest town in the north-east, specialist firm Double Take Projections will be emblazoning animations across the Blue Toon building. From 4pm to 10pm every evening a loop of various projections will be displayed across the building on Broad Street which was chosen for its flat front. Organised by Rediscover Peterhead, who are aiming to revive the town, it’s hoped visitors from across Aberdeenshire will come to see the spectacle. In the past Double Take Projections have lit up His Majesties Theatre and Marischal College. Rediscover Peterhead manager Iain Sutherland said: “This light show is spectacular with nothing like it in the north-east of Scotland. Local councillor Dianne Beagrie went along to the launch event on Saturday to see the projection. She said: “The switch on had a good public turn out. 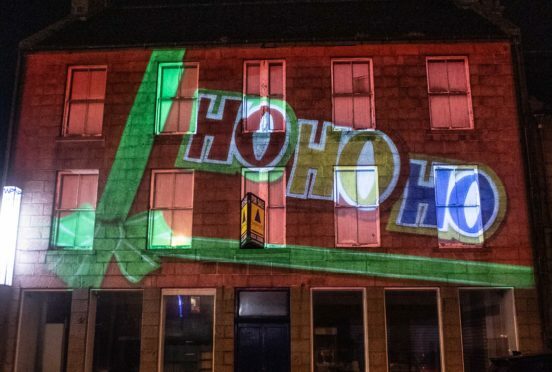 “The images being projected onto the building include the Light Up Peterhead snowmen, local fishing boats and Santa.